Photo by Yoshikazu Tsuno / Rimono. 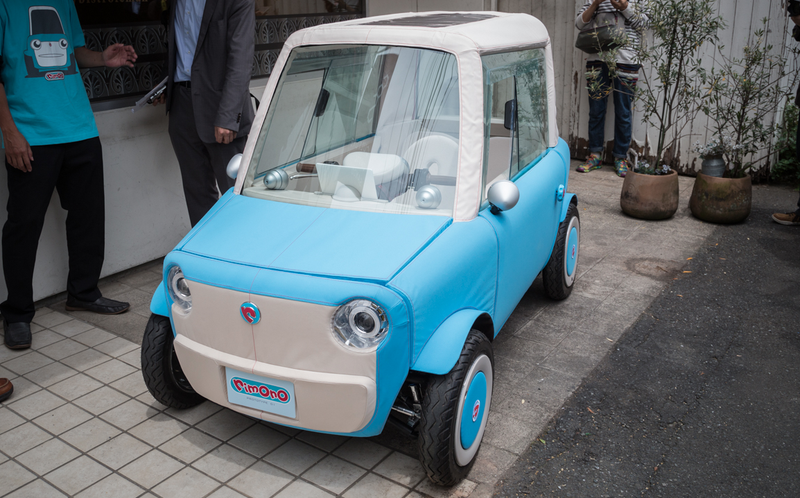 What happens when you combine the Japanese engineering tendency to miniaturise with Japan’s society-wide obsession with cuteness and apply it to electric cars? The Rimono: a plush body electric car a fourth of the size of a regular car which still seats two adults comfortably. Former Ministry of Economy, Trade, and Infrastructure bureaucrat Ito Shinsuke and ex-Toyota designer Nezu Kota came together to create what likely is the smallest electric vehicle ever intended to actually be driven on actual, normal roads. Well, normal Japanese roads, in any case. The tiny vehicle, named the Rimono, is a two seater designed to help aid those who are in most need of small vehicles to make quick trips around Japanese tiny labyrinthian streets with more support and space. The designers specifically point to the examples of young mothers driving their children to the nearby kindergarten, or senior citizens no longer capable of biking or walking. The saccharine-sweet cuteness of Rimono’s front “face” adds onto an already overtly adorable build shape with body panels of stuffed fabric by maker Teijin. You are even able to customise the sound the little EV can make to warn passerby. Including overtly cartoonish sounds that fit the overt personification of the vehicle. While it probably won’t stand up to any kind of impact, it is also unlikely to go above about 20 kilometers an hour, which is fine for the short distances needed by the target demographic.